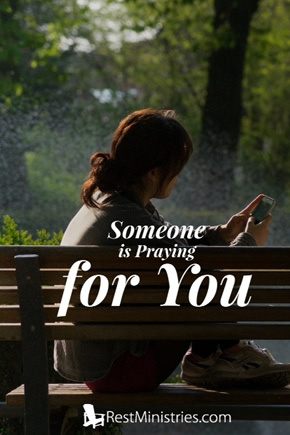 When the loneliness creeps into our heart, does it help to know spend is praying for you? Kerryn shares. “I pray that the eyes of your heart may be enlightened in order that you may know the hope to which He has called you, the riches of His glorious inheritance in His holy people, and His incomparably great power for us who believe” (Ephesians 1:18-19a). It’s easy to feel completely alone in this life with chronic invisible illnesses. Regularly I hear the same from others, who daily battle that dark, cold, and all-encompassing feeling of loneliness. We can feel lonely, despite being surrounded by family. The middle of the night is loneliest, when I’m unable to sleep and surrounded by darkness, increasing my fears. Recently, our suburb had a power failure late at night. Sometimes this happens weekly, so I’m used to them. However, this particular power outage created panic about being cut off from my online friends. The flicker of a candle not only lightened the dark room, but enlightened my heart. For a moment I had a heavenly view of my life, which I’m not sure that I can put into words sufficiently. In that moment it was as if I was seeing people praying for me right there in my lounge room. There were online friends, family who are now departed, people from the past and the present all praying for me–simultaneously. God is omnipresent and His timelines are not like ours. In this vision people’s prayers were loud and clear, being shared from a loving heart to our beloved God–for me. Imagine actually seeing all of the people who are a part of your life, past, present, and Eve future, praying for you in one moment in time! Can your hear the sound? The room is full of beloved friends, family, and even people unknown to you praying on the other side of the world for situations such as yours. Seeing with God’s enlightenment suddenly gave me hope. I am not alone! Prayer: Lord, thank You for the faithful prayers of people from our past, present, and future. Thank You especially for people who pray for others whom they haven’t even known. When we’re lonely remind us of Your love for us and of the many prayers said on our behalf. Amen. Kerryn Wright lives with her family among the gum trees in South Australia. She was a special education teacher prior to chronic illnesses. Her husband is carer for three of their family, who have chronic illnesses and disabilities. God has always guided them through life’s challenges, often in surprising ways. Who would be on your list of people who have prayed for you that you know about? Have you ever considered that people you don’t even know are praying for you? Can you imagine everyone who has ever prayed for you in one place in one moment in time? Wonderful devotion Kerryn! Excellent imagery about those who pray for us and not truly being alone. Wow. Just wow. What a vision! I remember several years ago, when I was very ill with undiagnosed celiac spruce, knowing … Feeling …. I was being prayed for and having the thought that I wondered what would happen when people stopped. Love the idea of the prayers still being uttered. Reminds me of the book “Miracle at the Higher Grounds Cafe” by Max Lucado, where prayers were light which shone between heaven and earth. Thank you, Kerryn! Wonderful that it brought back memories of times that you felt supported in prayer. Thank you Kerryn for sharing how the Light of God overcame the darkness that night when you had the vision of people praying for you.I pray rest and peace in your body, mind and soul, as well as for your entire household.I also pray that you would be encouraged, knowing the Lord intercedes for you always. A while back on two separate occasions I was praying for different areas of the world. Another time, I was praying for New England. My home state is CT. AS I prayed, it was as if I was an eagle. I traveled over each state and Holy Spirit told me specific things to pray for in each state. AS I approached ME, I started a descent that was pretty fast. As I was going down, I knew the Lord was using me to target someone. AS I was going down, through dense woodlands in a area of ME, I eventually knew that hidden in these woods, was a house…a small cabin really. In this cabin, that was miles away from any humanity, lived a loner…a man…whose life was hidden from others…He preferred it that way. He had suffered deep hurts. But I knew I was to pray for him and what I sensed the prayer should be … that He would come to know the LOVE of Father God. These two situations taught me some things. Very inspiring devotional Kerryn! Sometimes I feel as if no one is praying for me but I know that’s not true. You can feel the power of prayer! Great song Lisa! I guess knowing people are praying for us, is so much more powerful seen in such a visual way – I couldn’t help thinking about what an amazing mix of people/span of years, that might be – all in one room!! One day we will all be celebrating together in one place – maybe recalling all those prayers that were prayed over the years. It’s such a blessing knowing that people, some I’ve never met, care enough to be praying for me – God’s awesome provision. Wouldn’t it be cool to see everyone from Abraham through to the future of people that have prayed for us!! We will one day! Thank you so much for touching my heart. Thanks Sandie 🙂 I’m delighted that God touched your heart through this. Thank you for this sweet and thoughtful vision you’ve given us all. Kerryn, what an encouragement to think of people who pray for us. It definitely takes a lot of that “aloneness” away. We who are in God’s family are closer than any of us realize don’t you think? Your devotional is motivating me to pray more for others, and more earnestly too. I read this in Lin’s comments, “I also pray that you would be encouraged, knowing the Lord intercedes for you always.” What I intended to say was just that: Jesus Himself prays for us. Rom. 8: 34b says, “(Christ) is even at the right hand of God, who also makes intercession for us.” Wow!!! Thanks hon. And thanks for praying for me. Yes, it’s VERY cool & encouraging to realize that Jesus is amongst those in the room praying for us!! I agree that it encourages me to pray for others too. It especially encourages me to pray for our Christian brothers & sisters who are being martyred for their faith, often suffering in lonely prison cells. May God encourage each & every one of our brothers & sisters all over the world who are suffering in any way. Amen.